The Cumberland & Dumfriesshire Farmers Mart plc had forward 32 prime cattle, 11 young bulls, 7 over thirty month cattle, 13 spring lambs, 4,987 prime hoggs and 2,938 cast ewes & rams at their weekly sale at Longtown on Thursday 24th April 2014. Prime cattle were slightly harder to cash as the deadweight prices continue to fall. The best end were still keenly sought after and topped at 227.5p for a Limousin heifer from A. & W.J. Taylor & Son, Dashwellgreen. British Blue heifers sold to 225.5p shown by P.T. & J. Inman, Kilnknowe Farm. 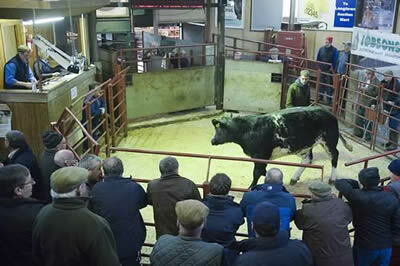 Bullocks sold to £1,553.88 from Messrs R. Byers & Son, Woodslee. Limousin 227.5p, 222.5p, 213.5p Dashwellgreen, 212.5p Houghton House, 211.5p Houghton House, 207.5p Sceughdyke, 205.5p Wyseby Hill Cottage. Limousin £1,330 Dashwellgreen, £1,290 Houghton House, £1,255 Sceughdyke, £1,200 Houghton House. Prime bulls upheld national trend and topped at 189.5p for a Limousin from J. & P. Routledge & Son, Netherton. Black & White 144.5p Netherton, 143.5p Becton Hall. Limousin £1,231, £1,127, £1,084 Netherton. Black & White £933, £904 Becton Hall. A small plain show of cast cows topped at 129.5p for a Blue Grey from R. Ackerley, Henrys Hill. Blue Grey 129.5p Henrys Hill. Spring lambs sold to a top of £110 per head (305p per kilo) for 36 kilo Texels from Messrs Ramsay, Dockray Hall. More lambs now required on a weekly basis. A much larger show of 4,987 prime hoggs were forward to a full ring of buyers with trade being much better than anticipated and a quality show of hoggs easily sold with export type and lightweight hoggs keenly sought after. The overall sale average was 212.1p (219.1p SQQ). 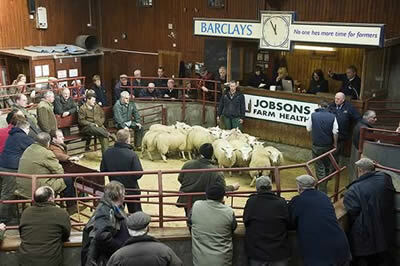 The sale topped at £132 for Texels from Messrs Marrs, Broomhills and to 277.8p for Beltex from Messrs Wharton, Snade. Texel £132 Broomhills, £124 Old Walls, £122 Blackhamilton and Station Yard, £120 Dunjop and Old Wall, £118 Dunjop, £115 Station Yard, £114 Dunjop and Station Yard. North Country Cheviot £115 Falnash, £106.50 Broomhills, £101.50 Little Culloch, £100 Ericstane, Little Culloch, Tundergarth Mains, and Longoe, £99.50 Creca Hall, £99 Stafford Terrace, £98.50 Waterside, £97 Cardewlees and Elveden. Beltex £114 Hyde Park, £104 Lairdlaugh, £100 Snade and Waterside. Suffolk £107 High Parson Bridge, £103 Broomhills, £102 Hyde Park, £101 Calf Park and Thorn Farm, £100 Calf Park, Cardew Hall and Elveden, £99 Station Yard, Howthat, Knowe Farm and Low Hallburn and Scotsbrig. Hill Cheviot £105, £104.50, £103 Sandbed, £103 Baltier, £102.50, £100.50 Shaw Head, £100 Stafford Terrace, Dunjop, Sandbed and Damhead, £99.50 Redwood House, £98.50 Shaw Head, £98 Damhead, £97.50 Redwood House. Charollais £99 Elveden, £96, £94 Moss Side, £90 Knowe Farm. Bleu d’Maine £96 Cardew Hall. Greyface £95 Elveden, £94.50 Kelmore Hills, £94 Low Hallburn and Baltier, £93.50, £93 Elveden, £92 Glenrath, Broomhills and Kirkland Green, £90 Eycott and Elveden. Lleyn £93, £87 Howthat, £80.50 Nether Gribton. Blackface £90.50 Smalmstown, £90 Catslackburn, Baltier and Nether Onsett, £88 Longburgh Fauld, £87 Sykehead, £86.50 Draniegower and Pennersaughs, £85 Catslackburn, £84.50 Cruggleton. Swaledale £77 Prior Rigg, £74 Pasture House, £73 Wham Head, £72 Patties Hill. Beltex 277.8p, 250p Snade, 250p Waterside, 236p Lairdlaugh, 222p Snade, 204p Hyde Park. Texel 275p Ericstane, 271p Station Yard, 258p Lairdlaugh, 257.1p Kelmore Hills, 256.1p Ericstane, 255p, 250p Allerby Hall, 250p The Firs and Waterside, 248p Old Walls and Station Yard, 246p Willimoteswick, 244p Allerby Hall. Hill Cheviot 253p, 250p Shaw Head, 250p, 249p Sandbed, 245p Shaw Head and Sandbed, 240p Baltier, 238p Wood Farm, Ericstane, Sandbed and Redwood House, 237p Longoe, 234p Todhillrigg. North Country Cheviot 248p Broomhills, 236p Little Culloch, 233p Ericstane, 229p Waterside, 226p Allerby Hall and Longburgh Fauld, 223p Hyde Park, 216p Creca Hall and Howthat, 213p Little Culloch, 212p Almagill. Suffolk 221p South Lambhill, 218p Eycott, 211p Pasture House and Hyde Park, 210p Broomhills, 209p Dunjop, 208p Sykehead. Blackface 220p Nether Gribton, 219p Bush of Ewes, 218p Draniegower and Baltier, 217p Becks, Cruggleton and Cronklea, 216p North Park, 215p Smalmstown, 214p Stafford Terrace and Baltier. Lleyn 218p Nether Gribton, 216p Howthat. Swaledale 203p Wham Head, 200p Patties Hill, 190p Pasture House. Bleu d’Maine 200p Cardew Hall. A larger show of 2,938 cast ewes and rams were forward to the usual ring of buyers all keen for sheep. Heavy ewes would be £4 to £5 dearer on the week with lighter ewes £4 to £5 easier than last weeks extreme rates. Tups remain easily sold. Cast Rams:- Texel £158 Summerhill, £147 Seaview, £146 Dunnethill, £145 Tundergarth Mains, £142 Barglachan; Suffolk £154 Zetland, £142 Albierigg, £140 Dunnethill, £138 Seaview; Leicester £152 East Unthank, £130 Albierigg, £126 East Redfordgreen; Charollais £134 Dunnethill, £130 Little Bennane, £128 Seaview, £126 Harper Hill; Dorset £132 Seaview; Hill Cheviot £128 Oakwood Mill, £108 Catslackburn; Beltex £124 Fellview, £102 Willimoteswick; North Country Cheviot £122 Ericstane, £100 Seaview; Bleu d’Maine £120 Garden Cottage; Blackface £98 Edges Green, £91 Catslackburn, £76 Bush of Ewes; Easycare £87 Lindean Mill. Heavy ewes:-Texel £136 Seaview, £132 Dunnethill, £130 No 2 Forss, £129 Dunnethill; Suffolk £129 Haithwaite, £120 Mid Upper Priestside, £119 Dunnethill, £118 Seaview; Bleu d’Maine £128 Dunnethill; Charollais £128, £117, £116 Lowerside; Beltex £120 Waterside, £105 Fellview, £100 Waterside; Leicester £116 East Unthank, £107 Greensburn, £104 Midtodhills; Zwartbles £113, £110 Howthat; Half Bred £108, £106 Haithwaite, £101 Hoddamtown; Greyface £100 Haithwaite, £92 Kelmore Hills and Willimoteswick, £90 Haithwaite, Beyond The Moss, Wyseby Hill Cottage, Awhirk and Hoddamtown; North Country Cheviot £100 Longoe, £91 Ericstane, £89 No 2 Forss, £88 Longoe; Cheviot Mule £99 Haithwaite, £90 Whitstonehill and Springwell, £89 Garden Cottage and Falnash.